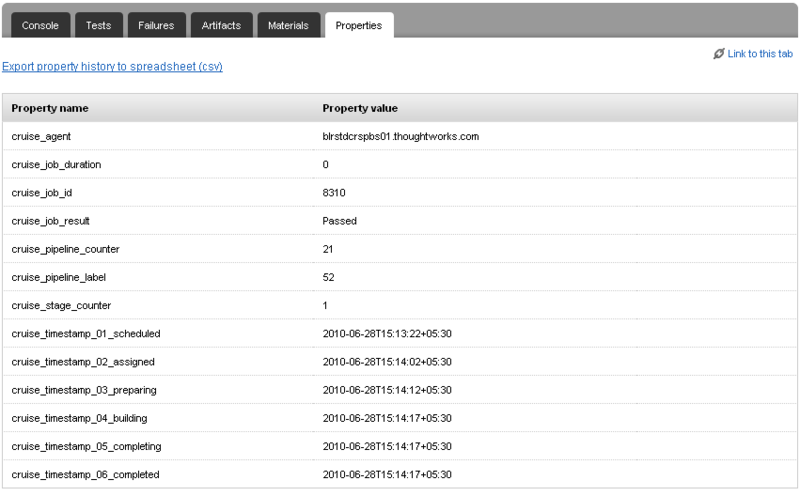 Properties provide a simple way of collecting metrics over time. GoCD sets some standard properties for you. You can also set properties yourself using the Go REST APIs (see Properties API for more information). GoCD also allows you to download the history of your job in a convenient CSV format, so that you can analyse the results in spreadsheets or scripts. GoCD allows you to download the history of properties that you have defined. This history is available as a Comma Separated Values (CSV) file. 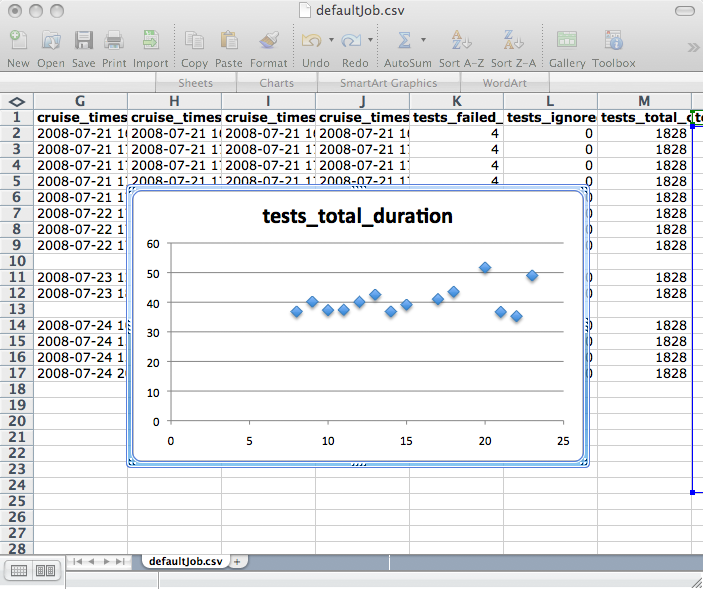 You can import this file into a spreadsheet program to generate charts and diagnostics of your project. To open the property history in a spreadsheet application, you can click on the Export property history to spreadsheet (csv) link on the Properties tab of the job. 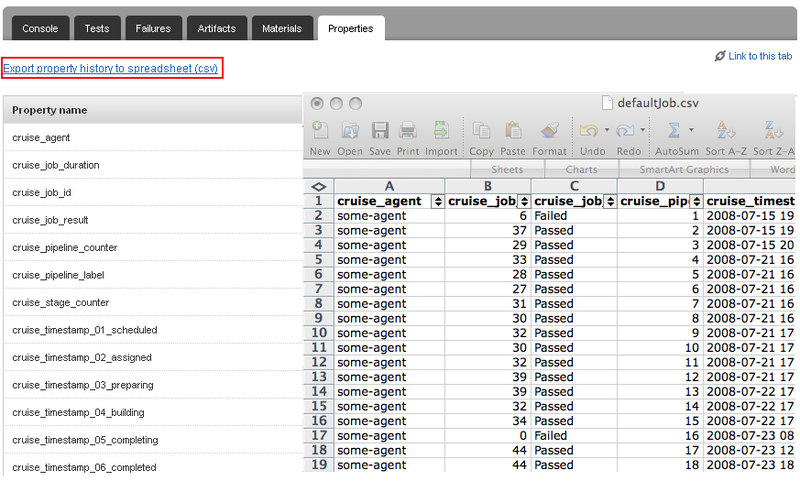 cruise_job_id – the name of the folder that the artifacts of the job was stored in under the artifact repository on server side (on earlier versions of GoCD). GoCD allows you to generate properties from XML artifacts that you create during the build. This can be used to harvest statistics produced by coverage tools etc. By storing them as properties it becomes very easy to show the history and trends over time of these values. Note that the properties are generated on the agent side, so the src path is relative to the working directory of the pipeline on the agent. If you define a tests artifact that contains the test reports, then GoCD will add some properties associated with the tests.